Here is a selection of essential accessories to make your drone safer, easier to use, and able to take better images. When your camera drone first takes off, you instantly gain a whole new perspective on the world, but to release the full potential of your drone you need to add some accessories. In this guide you’ll see the best accessories available covering all the most popular drones – from bags to lenses, goggles to prop guards. If you want to get more out of your personal aircraft, you’ll definitely find something useful here. Weight: 1Kg | Stores: Drone, Controller, up to 5 batteries & tablet (400 series has room for 15” laptop). Probably the best example of the most essential drone accessory: LowePro’s Compression-moulded FormShell design in the BP 200 series for Mavic Pro-shaped craft, and the 400 Series for Phantom-sized drones, are splendidly rugged. No cheap zips or shoddy stitching here, you can hike across country to reach the amazing locations your drone deserves, protected from bangs and buffeting even if you decide to run hard. Oh, and if you do run, there’s a separate space for a 2-litre hydration reservoir, so you’ll survive too! You might want to take a look at our separate guide to the best camera backpacks. Needing to be safely packed with sometimes-fiddly gimbal guards means drone lenses are especially prone to accidental dirt and marks. Worse still the kind of swooping, turning aerial shots in sunlight are highly likely to translate those marks into unwanted flare. That’s why it’s important to be prepared with lens (and filter) cleaning wipes & microfibre cloths. Your ‘trusty’ T-shirt is not a good idea; modern fabrics usually create streaks and sometimes even permanent microscratches. You might think of DJI as being a wholly respectable brand, high in the photographic and filmmaking firmament. You wouldn’t be wrong, but these goggles show DJI aren’t afraid of playing with the cool kids either. DJI’s first goggles worked only for owners of DJI’s aircraft (especially the Mavic), but the Racing Edition includes an analogue receiver too for use with the low-latency (50ms) analogue video from custom build racing drones. 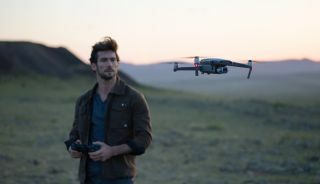 Connects wirelessly to DJI drones with OccuSync, with drone functions controlled via an easy-to-use touch-pad driven menu, the goggles also include an HDMI-in so you can take your own cinema on long journeys. Drone operators are legally required to maintain line-of-sight (to be able to see the drone from where they’re standing), but piloting is more fun when you see through the drone’s eye – called FPV (First Person View). UK rules allow a ‘spotter’ (a buddy watching the drone) if you wear traditional goggles. But the Epson Moverio Smart Glasses’s unused screen area is transparent, so the effect is a 720p Silicon OLED head-up display. Powered by a quad-core Android system, the glasses substitute for your phone, and run the DJI Go App. A touch pad and on-screen pointer serves in place of the phone’s touch-screen. The system supports 3D and AR too, via its own Apps Market. Impressive 6 hour battery life. The Insta360 (and newer 360 ONE X) are amazing devices in their own right, and can create drone-like “Bullet Time” clips without a drone. You simply swing the device on an extendable “invisible selfie stick” to get amazing orbital shot. For more range than a stick, however, you need to fly, which is where the mount comes in. Obviously the extra weight is going to reduce your flight time, and you’ll need to fly more gently, but Insta’s FlowState stabilization is good and there’s no worrying about where the camera is pointing while flying! Owners of DJI drones like the Mavic series usually make use of their phones as the remote screen, which has advantages (you’ve got one, and can easily share immediately) but it this comes at the cost of your phone battery. The Smart Controller provides Mavic owners a bright (1000 nits) built-in screen that works in daylight. This comfortably beat’s an iPhone X’s 800-nits, so you can get flying with easily in the sun. Ironically DJI have a reputation for better reliability on iOS than Android, and that’s still true here. There’s no sim card either, so you need to load map pages before you go (or from your phone). The Ultra sports a 2000-nit display which is stunning, even in bright sunlight, and the chunky size feels rugged (there is a cheaper 1000-nit version). There is 980 mAh battery inside, but pros can use swappable 4920mAh batteries for 4-5 hours, even in extreme conditions. As with all of DJI’s in-built monitor systems the compromise is a mediocre Android system that doesn’t feel as snappy as an iOS device, but you can use it to edit video in the DJI GO App. There is HDMI out at up to 4K, but sadly not back in. What’s the best memory card for 4K? Not all memory cards are created equal, and a slow card can risk video cut outs. The SanDisk Extreme Pro suffers no such issues, with a read and write speeds in excess of 90 MB/s and the crucial U3 support (DJI officially recommend only U3 cards). 64GB cards are idea for a good few batteries, and a very cost-effective size, but you could splash out on 128GB for a long trip. Naturally there is an SD adapter supplied – only real complain is the packaging – it’d be nice if there was no plastic. Worried about lithium battery fires? Although far from common (certain Samsung Note 7 honorably excepted), Li-Po batteries are a fire hazard and drone batteries pack a lot of ions. It makes sense to keep them in a fireproof bag. CamKix produces a series of elegantly shaped bags for DJI battery shapes which are a little more elegant looking than the classic hobbyist Lipo Guard bag, and are easier to fit into backpacks. If you want to use a bigger screen with your Mavic Pro, or other drone with a compact fold-out controller, then you could do a lot worse than this sturdy iPad mount. Even if you stick to your phone, there is a lot to be said for putting it above the controller like pro systems, and it’s very handy to have a neck-strap to rest the weight on. You can’t just through your drone lose in your day-bag because of all those delicate parts, like the propellers. You wouldn’t want anything else in your bag getting caught and doing irreparable damage. The idea solution is a small pouch, and what could be better than these? Although charging hubs are specific to individual battery types (in other words you’ll need one for each type of drone you fly), the way they smoothing the stress of handling multiple batteries is hard to understate. If you’ve got four batteries that take 90 minutes to charge each you need to stay near the charger for 6 hours, swapping occasionally. A hub plugs three or four batteries onto your original power brick, sending the charge to one battery after another automatically, letting you do something more productive (or relaxing) with that time! The Inspire 2’s ‘drink can’ design is an especially cool one. Want to fly your drone indoors, or near some trees? You’re going to need some propeller guards. Manufacturers offer custom guards for most models which fit over the motors and prevent the spinning prop from being damaged if you glance a wall or, well, organic obstacle, shall we say? The guards are best for bumping – to keep fingers from the props splash a bit more cash and sacrifice a few more minutes for a full Prop cage. Use with your phone, tablet, laptop or drone! If you don’t already carry a portable charger, you should. This is one of the more expensive, but also one of the best. There are so many reasons, and newer drones have given you a couple more: built-in USB-C charging. The Parrot Anafi and DJI Mavic Air (but not Mavic Pro) series can be charged in your bag as you walk along from just the battery pack and a USB-C cable. It might seem pricey (if you’re on a tight budget try the RAVPower), but the PowerCore works with fast-charge devices, has an elegant charge dial and a sturdy shell. Many pilots like to use an iPad or iPad Mini as their monitor and for good reason; the bigger screen makes it much easier to see the final video shot you’re getting and less of the overall space is obscured by on-screen buttons and flight data. The only problem is the ambient sunlight, which makes it much harder to seeing the screen. A cheap and practical solution is this folding sun-shield which every drone operator should have in their bag. The Anbee Sun Hoods are available in a variety of sizes, so ensure you get the right size to suit your screen. The first thing any landscape photographer will tell you to buy is a set of Neutral Density filters. These reduce the amount of light getting through the lens (ND 4 is equivalent to 2 shutter stops), so, in bright conditions, you can use a longer shutter speed, creating a more cinematic look. A Polarizer has the added effect of cutting down reflections for a richer, more contrasty image, great with water. Aluminium alloy frames keep the weight down, and at this price who could argue. Make sure you get the right size for your drone’s camera. If you’ve got a compact wi-fi drone which you control with your phone, like the Tello, then you can get that pro-drone feel by adding a games controller. The SteelSeries Nimbus isn’t the cheapest, but there is an iOS version as well as Android and, crucially, it has two high-quality analogue sticks positioned evenly (some only have a D-pad on one side which isn’t as natural for flying). This 1000-lumen waterproof light, with a design styling not unlike that of the GoPro Hero Session, is available with adapters for a number of popular (and less popular) drone models. Where you’re permitted to fly in the dark (check the regulations), these lights can assist in search & rescue or be used for very ambitious light painting. Put your camera down low, point it up at your drone and make your own UFO movie! The more batteries you own, the longer you can fly before going home! Check you get the right type for your drone! It might seem obvious to old hands, but extra batteries have a kind of exponential benefit. When you go out flying, you might pick a nice spot, get out all your gear, check the props, and take off, only to have to return in 20 minutes or so and pack up again. An extra battery gives you a whole extra flight but doesn’t add to your unpacking/packing time, so it’s a real benefit. Make sure you get the right batteries for your drone. Adam Juniper is the author of the bestselling Complete Guide to Drones, now in its second edition, and The Drone Pilot’s Handbook.